Most everyone has a place in their yard that would be suitable for a rain garden. 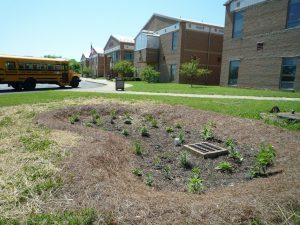 Any area that receives some (but not too much) rain water runoff can work. Below are some tips for finding a good location. Locate your rain garden down-slope from downspouts, driveways or other areas that direct water through your yard. Sunny or partly sunny locations are ideal, but shady areas can also work very well. Construct the garden 10 feet or more from your house to keep water away from the foundation. Also, avoid placing rain gardens over or near the drain field of a septic system or below-ground utility lines. Consider where the water will enter the garden and where it might overflow. Make sure it doesn’t go in an unwanted direction.